Fall has arrived across the Northwest and we've got a cool update for you all on the latest NFS happenings within the River Steward Program. In this edition, we've got new NFS staff, a 2018 Gatherings Recap, upcoming opportunities, the latest science, an exciting new partnership, and things to look forward to for the rest of this year. Welcome new staff member: J. Michelle Swope! 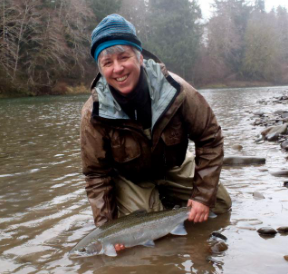 We are excited to announce that we recently hired J. Michelle Swope as Washington Regional Coordinator to manage River Steward activities and campaigns in Washington state. J. Michelle grew up on the north end of Hood Canal and brings to NFS a passion for working with local people, deep connection to Washington, and desire to support our existing stewards and grow the program across the state. Please give J. Michelle a warm welcome when you see her at the next NFS event, and don't hesitate to reach out to introduce yourself and learn more about what she's up to in WA. This year we hosted three Gatherings across the Northwest. In total, over 60 people came together that included River Stewards from three states, UC Davis researchers, a WDFW research scientist, partner organizations and new friends - all with the goal to share stories of conservation, learn about the latest science and policy decisions, and connect with the largest, grassroots network of wild fish advocates in the Northwest! In addition to the great discussions and presentations, we whitewater rafted a tributary of the Klamath River, watched gray whales surface off of Whidbey Island, and took a hike to see wild steelhead at the base of a series of waterfalls in the Columbia Gorge, it was quite the year! Thank you to everyone who joined us in 2018. We're currently putting together our plan for next year's Gatherings, and hoping that you all can plan on joining us for at least one gathering in 2019. If you have specific content or ideas for the gatherings that we should add to our planning, feel free to send us an email and share your ideas. In 2018, NFS embarked on Diversity, Equity and Inclusiveness (DEI) work to assist us in addressing the challenges facing wild, native fish and the communities they support. Over the year, we held two DEI workshops in partnership with the Center for Diversity and Environment to increase the capacity of our staff, board, and River Stewards so that we have the perspectives and skills to collectively increase the diversity and inclusiveness of our community and the equity in our conservation work. To meet our vision of abundant wild fish and River Stewards on every watershed across the Northwest, we want to ensure that people from all communities and walks of life feel welcomed and comfortable in our organization and River Steward Program. This year we will be building our organizational capacity in this effort, and we would like to extend an opportunity for interested River Stewards to join our DEI Team. If you would like to learn more about this work and join our DEI team for 2019, please send me an email and I'd be happy to provide you with the details on how to be involved. Our Strategic Framework and Equity Strategy is available here. New Science: Recycled hatchery steelhead contribute minimally to angler harvest, and pose additional risk to threatened wild populations. A recently published study from researchers at the University of Idaho found that the hatchery steelhead recycling program in Oregon's Willamette watershed may pose additional risks to federally threatened wild winter steelhead in the Santiam basin. Steelhead recycling involves a process where fish managers collect hatchery steelhead that have returned back to the hatchery and then release them downstream for additional angling opportunity. This research suggests that there is a low reported harvest rate of recycled hatchery steelhead (15%), recycled steelhead often stray to other neighboring rivers (14%), and expanded estimates indicate that the number of recycled hatchery summer steelhead in the South Santiam outnumbered the number of native wild winter steelhead, a federally threatened species. Paper available here: "Release of hatchery adult steelhead for angler opportunity increases potential for interactions with endemic steelhead" (Erdman, et al., 2018). Announcing: Native Fish Society partnership with Sawyer Paddles and Oars! We are excited to announce that Native Fish Society is partnering Sawyer, the industry leader in craft paddles and oars for the water enthusiast! Sawyer is an American company with premium products made in the heart of the Rogue Valley in southern Oregon. With over 50 years of experience, they make performance products for whitewater rowers, canoeists, kayakers, surfers, and paddlers of all genres. As a thank you to your dedication to protecting your homewaters, Sawyer is offering a co-branded NFS // Sawyer collaboration with logo and discount incentives available exclusively to River Stewards. Thinking of getting a new set of oars? Hold on, and watch out for a follow up email with details on this great opportunity. At this year's Fall Gathering, we introduced a new tool for us to work with River Stewards and get a better understanding of the subjects and needs that you all are interested in learning about. In the coming weeks we'll be sending out a separate email to get your feedback in a River Steward Program Survey. Your feedback is greatly appreciated, and we'll have a special incentive for participating - so stay tuned! Thank you all for your efforts to protect and recover wild fish in your homewaters! Please reach out if you have any questions or just want to say hi, we always enjoy hearing from you.